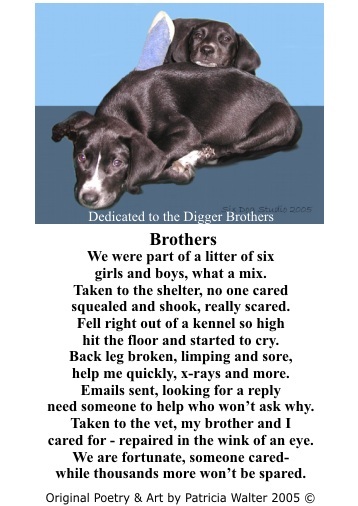 The Digger Brothers are the last dogs to enter our doggie family for a very long time. We had 14 dogs when someone from the shelter emailed me about a little puppy with a fractured leg. No rescue was willing to take him since his leg needed to be treated and he would be put down. I now try to stay away from the local shelter as much as possible since we already had 9 shelter dogs and 4 other strays in our house. I do the shelters website and try not to visit the shelter very often. My heart breaks every time I walk in the door knowing there are so many unwanted animals. My hubby and I answered the email and visited the shelter to see a litter of puppies that all seemed to have feet problems. We later learned that the puppies probably had poor nutrition and their feet dropped. One little puppy had fallen out of the kennel onto the cement floor because his kennel door had not been shut properly. His brothers and sisters were scheduled to be taken by a rescue group, but the puppy with the broken leg was not on the list to go. The shelter felt it would be better to put the puppy to sleep than let it continue to suffer. So we agreed to foster the puppy and have it's leg repaired. One of his brothers also had very infected feet and could not walk properly. We decided to take him too so the puppies would be able to keep each other company. Taking the two brothers home was actually exciting since we had not had five week old puppies for a long time. We normally adopted older dogs since they seem to be the last to get adopted. So we were to experience puppy breath for quite a few weeks. Actually, we experience a lot more than puppy breath! I had forgotten what puppies were like. Since we had 14 adult dogs that did not really like puppies that much, we decided to keep the brothers in the attached garage. We had recently removed the garage door and framed in the opening and installed a people door and a window. It was a perfect place for puppies to live and play. We used to have a temporary fence off the patio for the blind dog Robbie, but had finally removed it when he decided he only wanted to lay in the large yard with the big dogs. So we once again erected a temporary fence for the Digger Brothers. They really were very little work since they had they whole garage live in and had their own little fenced play yard. We quickly installed a new screen door with a built in doggie door. A doggie door that was to accommodate a 100 pound dog! Surely these little five week old puppies would never grow to be 100 pounds! Fritz had the fractured leg and wore a cast for six weeks. We had to have the cast changed weekly since he was growing so fast. Meanwhile, he ran around and wrestled like a regular puppy never paying attention to the large cast on his leg. He and Sluggo were best of friends. They did everything together. Mostly they dug holes together! Sluggo received antibiotics from the vet and his infected feet were improving. Both of the puppies feet gradually improved as we gave them the best nutrition we could buy in dog food. We thought we would be able to send the two puppies to rescue after Fritz's leg healed in six weeks. They were quickly growing into lab/hound mixes. Black generic dogs - as I called many of the shelter dogs. There were times that there were actually rows of short haired black generic dogs at the shelter. They were always the last to get adopted and always the first to be put down since there were always so many. We wanted Fritz and Sluggo to stay together since they seemed to be such good friends. I felt that six weeks together was a long enough time to bond and they would miss each other. Chances of two short haired black hound mixes getting adopted together was very slim. In fact, chances of two short haired black hound mixes getting adopted one at a time is very slim in our area. The more we thought about the Digger Brothers, the more we thought that we should probably keep them! It meant that we now owned 16 dogs. Way more than we needed. We had 3 very old older dogs that would soon be 14 years old, but they seem to be doing well. I actually use to think that they would leave us much quicker than they have. So we were at 16 dogs. The Digger Brothers were to become official Walter Family dogs. They are now about a year old, since it is fall of 2006, and are like little ponies. Sluggo can hardly fit thru the 100 pound doggie door. 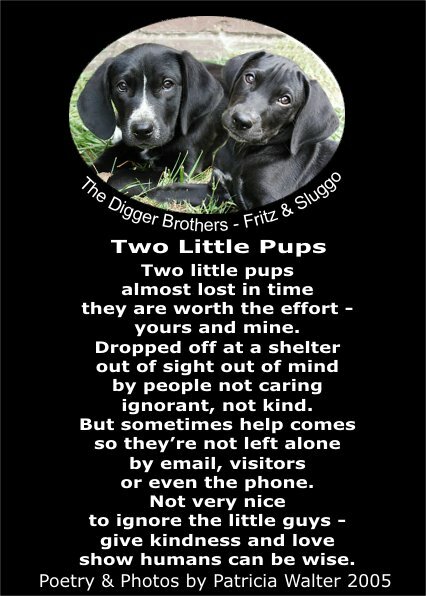 The Digger Brothers are very friendly dogs and just love each other. They still do everything together. I would hate to break them up. They continue to live in the attached garage with our three cats. Sometimes, one of the cats will actually snuggle up with them. The Diggers do come into the house sometimes, but not for long. The are like horses running in the house. They love to spend time in the big yard with several of our other dogs. They are not well coordinated and run like pigs. I don't know if that is whatever breed they seem to be or because of their poor nutrition and strange feet. But they are nice dogs and are the last to join our doggie family for a long, long time. girls and boys, what a mix. squealed and shook, really scared. hit the floor and started to cry. help me quickly, x-rays and more. need someone to help who won�t ask why. cared for - repaired in the wink of an eye. while thousands more won�t be spared.